With winter, comes Kalbarri season! Here is a reminder of our responsibilities up there. 1- Remember that no toilet waste is allowed within 500m of the Promenade / Rock wallaby site. Therefore, it’s best to use the toilet facilities at the Z Bend carpark before hiking down the gorge. No toilet waste area around The Promenade site. 2- Since the rediscovery of the rare Black Footed Rock Wallabies in 2015, camping is not permitted in the gorge within 1.5Km of the Z Bend Lookout – this includes the area around the Promenade climbing site. 3- However, there is a camping area near the Z Bend car park that is set aside for school groups, but the privilege is also extended to climbers. We are, however, on thin ice here so please register by completing the multi-day registration form and emailing it to either Mike Paxman mike.paxman@dpaw.wa.gov.au (Senior Ranger) or Lisa Gould lisa.gould@dpaw.wa.gov.au. 4- Climbers new to Kalbarri may phone the ranger to get directions to the alternate camping area (it is not sign posted). 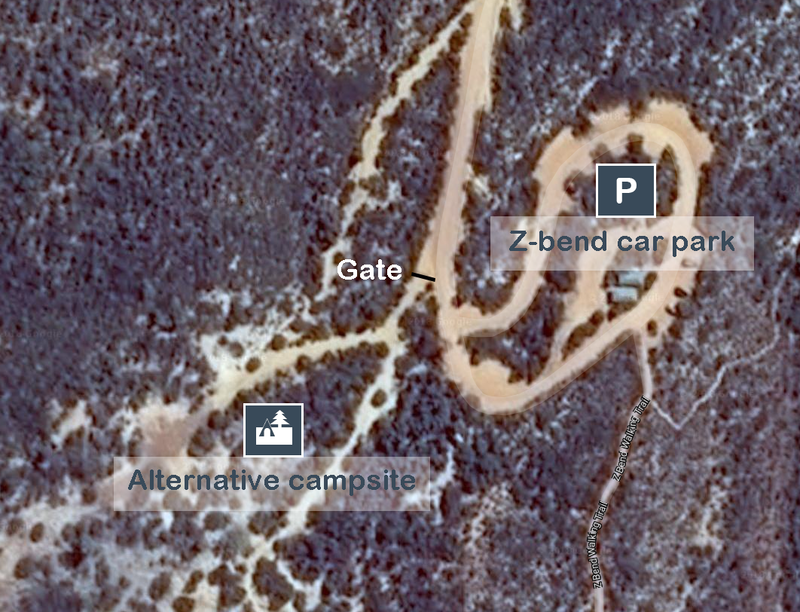 5- Immediately close the gate behind you when driving in and out of the alternative camping area near the Z Bend carpark. The campsite is 200 metres pass the gate. Please stay away from the vegetation regrowth and rehab area (short bushes and trees held up by sticks within the campsite) and do NOT pitch a tent there. 6- The campsite has no water and all rubbish must be taken out of the park. The toilets are situated in the Z Bend carpark area. 7- Due to the elevated risk of bushfire in the sandplain areas no open fires is allowed in the alternative camping area (gas cookers only). 8- Last but not least, remember to limit the use of excess chalk (especially on overhanging walls) and systematically brush it before you leave the site – the same goes for boulderers venturing on virgin rocks! Also, try not to use any chalk in high traffic areas such as the river trail / Aviary / Tourist wall. A Park Entry fee of $12 per car and a camping fee of $8 per night per person apply. The Park Entry can be paid for by credit card on the all-hours machine available at the main entrance of the park (just off Ajana-Kalbarri road). However, the camping fees must be paid for by cash stuffed in an envelope and inserted into the box next to the abovementioned machine. Following are the phone numbers for the Kalbarri National Park Office and the Rangers Mike and Russell. Please direct all general enquiries to the Kalbarri National Park Office. The Rangers numbers are there FOR EMERGENCIES ONLY. Great work guys, no excuses for anyone to plead ignorance. Any chance this info can be put somewhere easily accessible on the website (eg,in the Climb Section, miniguides?) so it doesn’t get buried within the forum over time? Hi Ang. This is something definitely on the agenda as we are working on the website.